Vijaya Bank has published a Advertisement for below mentioned Posts 2015. Check below for more details. Manager - Rajbhasha: Post Graduate Degree in Hindi with English as a subject at the degree(graduation) level OR Post Graduate degree in Sanskrit with English and Hindi as subjects at the degree (graduation) level. Application Fee & Intimation Charges: Candidates should have to pay Non-refundable 300/- & intimation charges Rs. 50/- for General & OBC category candidates. SC/ ST/ PWD candidates have to pay for intimation charges (Rs.50/-) only through online. 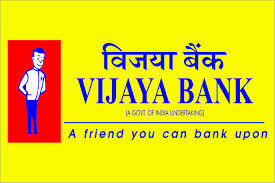 Address to send Application : Vijaya Bank P.O. Box No. 5136, G.P.O. Banglore - 560 001.